STOKE PREVIEW : NO LOVE LOST. One of the most accurate ways to guage what is happening psychologically within the camp of one’s team is simply by looking at what is happening within oneself. I’d never spare myself in any form to get Stoke bleeding. Never ever. I want them torn into pieces in the shark infested relegation waters, never to be seen again in the Premier League. I want Ramsey to go home with his hattrick ball, and on it written …. ” We mourn not Stoke FC”. If I don’t find myself celebrating our victory over them (6th place … bah), bet your bottom dollar that I’d be over the moon watching Stoke dazed, in despair and going down, down, down. I would field a team to demolish Stoke. CSKA Moscow is a good four days after so there is everything to gain by using the Stoke match to get our team back to our pre inter-lull heights. It’s our luck that fielding our strongest team against Stoke is completely allied to prioritizing the Europa Cup. Of our five first teamers who played for their country on Wednesday, I would only have doubts about Koscielny for match selection tomorrow. Games will be coming thick and fast from now on and for this one I’d pencil him for a day off, then pick our strongest team. One little other consideration. Lacazette has tasted the Premier League. I hear he has been inoculating himself in the gym against its pace and power. I would like to unleash him against CSKA Moscow so I’ll give him some minutes in this encounter for raising his match fitness. Does he get about 60 minutes or will he be used as an early substitute? Of course Auba is the first name on the sheet, meaning we’d have two strikers on the field. Is it 4:4:2 then or would Laca take the place of one of the midfielders as Steve Bould indicated he can? Has Wilshere recovered sufficiently from his minor knee injury to be involved in this match? I’d always give Wilshere a little bit more cushion. I am buzzing steely eyed. Our camp also. I don’t want to bore myself and you with details on Stoke. I don’t give a damn about who they have fit or not. I already know that they are a very poor side, sitting 19th on the table. I also know that Auba need not worry because he’d be too fast for Ryan Shawcross. Kola, Eln, Wilsh, Iwobi, Welb. Am thinking of Stoke (sadistically), am thinking of Europa, am thinking of next season. Am a Gooner for life!! Thanks for a great appetizer for the game, PE. Top battle cry and I agree with the sentiments re the Orcs. It would be fantastic if they get relegated this season. I was at the game at the proverbial hole when Aaron got his leg smashed and the crowd and the players made this happen, let there never be any doubt about it. I am a bit wary of the new manager, though. Lambert prepares well for these underdog confrontations and he has beaten Arsenal once or twice with Norwich through his tactical adjustments. I would be tempted to keep Aaron out and play Elneny instead. We really need Rambo against the Muscovites fresh and focussed and a game against the Orcs could destabilize him. Well written PE I didn’t know you were a secret Stoke fan? I think your team is nearly there, unless he is injured , I think Chambers is marginally ahead of Holding in the pecking order. I very much doubt that Laca will start, I would play Jack assuming he is fit. No flaws in your reasoning. Those points that aren’t primary to my view? You’ve convinced me. Agreed on Kos’ and Jack’s observing today. Your lineup– just one small tweak for me and it’s positional. Prefer Mkhi on the left. IIRC we had him out right in the second leg vs Ostersund and the PL City match– and he was hardly visible. With the exception of Watford– Mkhi’s best form and production have come from playing an inverted LW. This run of PL matches to end the season are the perfect time to give Holding some starts. Kos is better suited for the EL competition in front of us IMO. Kos fresher and Holding with substantial minutes seems a positive approach. Occurs that Chambers has filled in more on the right (RCB in a 3-back, RB and RWB) than on Mustafi’s left– no? Opportunity to play Chambers and Holding surely? ?Leaving out Mustafi would not weaken the team in my opinion.He is a very average centre back. I’m with you PE, I was at the old Stoke ground when their crowd got Alan Ball and Peter Storey sent off, they really do hate us that much. But then I despise them with a passion and would simply love to see them on the end of an Arsenal thrashing, not least for the damage it would do to their goal difference. My only change to your XI PE would be positional, Lacazette in the hole, Mick on the left and Mez on the right. But like you PE, I’d go for a strong side so we can get back in the groove again. The time to rest our players is probably before and after the trip to Moscow. Arsenal, through the years, have been renowned for a plausible trust on talented young players who are moulded and nurtured to stardom and alongside Barcelona’s famed LA Masia had more than made name for themselves with their continuous budding of potentials in their own distinctive way. Alex Iwobi and Chuba Akpom count as Nigerians who had made the jump from the Hale End to feature for the first team, all thanks to Arsene Wenger’s lucid management and the Nigerian contingent have only burgeoned in the youth ranks. With this piece, just a few of the Nigerian youngsters at the Emirates outfit would be brought to readers briefly. 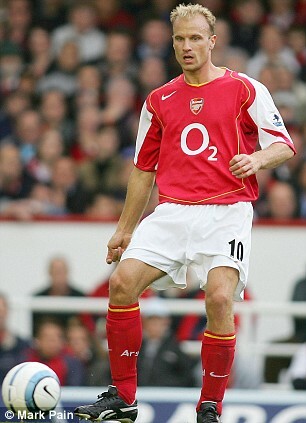 (1) Xavier Amaechi: Amaechi has undoubtedly been the epitome of perfection which Arsenal as a club, has been known for. Aged just 17, he has already featured three times for the club’s U23 side and has proved a handful in the U18 Youth league, scoring four in four appearances, a tally which could have been more if he has had better luck with injury this term. (2) Tobi Omole: The young defender has made 12 appearances for the U18s who sit second on the youth league table and his consummate performances will lead to his promotion to the U23s next term. (3) Folarin Balogun: 16-year old Balogun has already scored seven times in just eleven outings for the youth side while getting four further appearances for the U23s and is most certainly primed for first team action when he comes of age. (4) Tolaji Bola: Bola is another of Arsenal young defenders to consistently turn out for Arsenal’s U23 team, shipping in with important assists occasionally. (5) Arthur Okonkwo: The highly-rated goalkeeper has made remarkable progress with the Gunners youth ranks and has been invited by Arsene Wenger to train with seasoned first choice options, Peter Cech and David Ospina a couple of times in the past. Great comments all. Each has a “green shoot”. No despondency. I can even sense a “young excitement” in me as if we are about to turn a corner. I wonder if that excitement is that football is back and inter-lull is gone. Or maybe it’s due to all the big names in that line up .. Xhaka. Mkhi. Auba, Laca, Ozil, Rambo etc. Or is it that we have finally adjusted to a realistic level of expectation. Maybe a mix of all but am sure looking forward to tomorrow ……. ah, it might be my certainty that the Orcs are getting mauled tomorrow. Am amazed at your knowledge of our Academy players. That sector is absolutely real to you and that is great. Am surprised there are so many young talented Nigerians there. I suspect there must be a measure of Kanu’s legacy here, still burning bright for many Nigerians, in it all. Here’s a bit more for ya…. That one’s the priority, of course, and, because they’re both home matches, it’s all about a first 11 (well 9, assuming the keepers switch and because PEA up top would likely give way to DW for Thursday’s match) honing their work between the last man and the guy(s) who might net the goals. It’s all about technical superiority, outplaying the opponent while in possession and getting it back quickly (and with some menace on the break) if they dare to try and attack in our end. Three. I’ve only had 3 pints HT. Though heading out to a late-lunch for Cajun fare. Which naturally calls for more beer. OK. So probably a half-dozen all said-and-done. And I still like PE’s lineup with Mkhi on the left. As I see it, the critical thing lies on how positively a player can channel his emotions. No way he can run away from emotions. As for me as a fan, those little swings in emotions create the excitement that makes me a fan. I know that Buđda the Enlightened, totally free from any form of attachment would never have been a fan of any team. Purged of emotions and one has ceased to be a fan. I think 17 is right, we should not be driven by hate. Having said that, they have been a very nasty bunch to our players for the last few years and the players will be fuelled by this once again tomorrow. Lets spank them properly and then shake hands at the end. That said, it doesn’t sound as much fun as the day J-Dub is having…. Of cause all the talk about the Orcs is a banter. The same as the Spuds. Anybody taking them too much to heart has missed the point. I insist however that a fan must ride with the pendulum to be a fan. For me it should be a pendulum with a small amplitude …. interplaying in a world of opposites, the yin and the yen, the pain and the pleasure. Assume a lotus pose underneath a Bodhi tree and after long meditation you’d be able to be free of the fandom. Good luck. Total, I wasn’t trying to catch out PE, honest mate…. Lastly, one player comment, again especially if emotions rule. I like Holding over Chambers for “mental toughness vs assholes” … something he’s demonstrated motivates him in past. PS: JW it’ll be April 2 here in NZ by the time you read this! Holding looks one that’s able to channel his inner stuff very well. The main reason though I chose him over Chambers is because Holding is more used to the left CD role (mentioned earlier by jw). If it had been Musti out and Kos in then I’d have Chambers as the right CD. One other thing. Modern defenders, particularly for teams that build from the back like Arsenal, must be good passers of the ball. That’s where Holding’s greatest strength as a defender lies. In this department I rate him even better than Kos. is there a bigger ego in football (other than Jose)?? ZI is one interesting story! Total, I did chuckle when I read that piece about Zlatan, he is a larger than life personality who just says what people expect him to say, he kinda plays to the gallery. All the same I do like him and wish he’d signed for us when we could have got him many years ago – another who slipped through the net. He has this reputation that he plays up to but he has every right to be confident as he is a great player. Whatever amount they (LA Galaxy, MLS) are paying Zlatan– they’re going to eventually pay him more. He is a walking, talking (and scoring) PR machine. At his most base, a raw, pure competitor. Subs: Macey, Kosh. Kola, Xhaka, Iwobi, Mkhi, Lacaz. Apparently, like myself who overslept this morning, Arsenal have too. At halftime, I am about 20 minutes in on the DVR– and it was almost 18 minutes before Ozil had his first touch. He had to come back past Elneny at midfield to get one. The passing has been atrocious, though not damaging to the scoreline. Was trying to decide whether to fast forward to the half and pick it up again live. Then statred watching in 2x speed. At least it was entertaining to watch! Absolutely no energy in our play. Stoke won’t make it easy, for sure, they’re fighting for their lives, but we seem to be giving away a lot of cheap possession Retsub, makes you wonder how focused we are on this game? JW, well done you for getting up mate, you are a true Arsenal fan. The atmosphere sounds toxic from what I can hear on the radio. A spark is most def required. I’ll leave it to your keen and experienced ear Kev as to the atmosphere. But the attendance in view is about 50%– and unlike most broadcasts– I can pick out individual voices of folks in the seats– normally a din. Not to be contrary, but I also think that we have good energy but a lack of quality and precision… An hour in and maybe we’re starting to get on top just a bit… (A good move ended with Stoke lucky to block an Elneny shot…) and I’m hopeful that Lacazette can be an upgrade to Welbeck… I’d get Mhki in as well… Maybe for another English fellow…. One goal wins this one, I fear…. Elneny and Nacho with a pair of shots from an advance that can be described as ‘attacking’. I’m not sure what to make of this other than the fact we have made so many changes and perhaps, we have unwittingly allowed the players to believe we are only focused on the Europa league. It’s been rather pedestrian for much of the first half with possession being lost by pretty much every player. As expected, things have quickened in the 2nd half but we still keep making errors which give them a sniff from set pieces. Auba’s chip needed to be first touch to clear Butland. Very cool. I’m still 3mins behind! Maybe the teams focus is more on Thursday? I am not sure what the commentatator is on about the penalty being harsh, perhaps. Clearly, Indi has caught Ozil as he was about to connect with the ball, yet we are having a debate? A few must surely see the value in Xhaka. This must be the first game in which he hasn’t started and the whole team played like a bunch of strangers. We must stay strong now or this could end up a draw. 17tino, I knew you was there mate, listening to the sound down on the TV makes a lot of sense. Peter Crouch is on for the Orcs and the commentary has been on about his goal scoring record against us. One would expect we have a counter for that introduction. All about making it hard for him to reach the ball in comfort. Yeah Eris– any discussion of that PEN is drivel. This guy is a studio talking head– and he’s barely tolerable in that role. I’d once even put that in writing to NBCSN a couple months back. It’s game, set and match! Aubameyang volley. Whose the guy in the studio JW..? A lot of class from Aubameyang letting Lacazette take it…. Can we please buy Jack Butland? Now. Nice touch there. For Aubameyang to forgo a chance for the hat trick to give Laca the chance to take that penalty. 3-0! Who would have thought at the start. I am not criticising the guy, but it seems every time Ospina goes for a cross he gets injured. Or is he fibbing? 17HT I have never changed my opinion of Ozil, when he is good, he is very very good but when he is bad he is awful. I do believe that Ozil is a very intelligent footballer, but I do believe (wait for the flak). That he does slow the games down on occasions. There was an incident in the 2nd half when Arsenal broke really quickly. It was passed to Ozil who then spun around and slowed things down. In the old days (old git speaking). Arsenal often broke quickly and were going from one end to the other in short order. Actually, Jack looked out of sorts, and Ramsey needed a squirt from the oilcan. How is it possible it’s not the guy with a brace? I think that Jack made the difference…. Just different opinions jw1, but to clarify you are referring to a brace of goals? Nice touch to let Laca take the 2nd pen though. Can’t locate that commentator’s name. He’s not a first-team choice either. He’s the guy they break to– who is in charge of regurgitating gossip on-air, off-studio. If he didn’t have a raspy/gravelly Brit accent– he’d probably be a gigolo. Really annoying twit. Or even Ozil as MoTM. I’ll likely watch the match again– as I was playing catch-up. But until about 75mins there wasn’t much to credit anyone with IMO. OK JW, I understand that you have quite a collection of never-has-beens as your ‘expert’ analysers on US Soccer TV, mostly Brits, and you are welcome to keep them mate as we have enough knobheads on our TV already…. Robbie Earle is the only one I can tolerate Kev. And they’ve banished him from studio for a US Soccer has-been Kyle Martino. While Googling Martino– found he was running for President of the US Soccer Federation. Message: As long as he promises to stay off my TV. Effing horrible. Robbie Earle used to do midweek soccer TV in the UK and was pretty fair, considering that he comes from the Stoke area. I’ve never heard of Martino, JW, but ‘effing horrible’!!! Victor Moses costs Chelsea their 1-nil lead in 1st-half extra time– with a not-so-clever attempt at a clearance– leading to a goal-of-the-season-candidate blast by Erikksen. Chavs 1-1 Sp*rs at half. Hahahaha! That settles it then, jw1. Auba man of the match; followed closely by Ozil. I thought Ozil was magnificent today and really deserved a goal or, at the least, an assist. He kept creating after that lethargic start by the whole team. There was a point when I thought Jack was trying to sabotage the side, getting himself easily dispossessed or misplacing passes with hungry Stoke attackers about. Chambers looks like one who needs game time. I hate to say it but this Spurs side do look hungry; it would be something of a travesty if they don’t get a shot at something soon, on current form. On that note, the run in to the FA cup will be very interesting with 3 of the sides in the semi-final having a real need to win it. If United are beaten in the semi, the tiny tots will fancy their chances. Honestly did not see that before I posted the Auba/Ozil recs– nor look specifically for something to confirm. Just felt there was little to distinguish anyone until 75mins+. Then it has to be the guy who was on a hat trick (who classily gave Laca the PEN attempt)- or the guy who pulled the strings so well. And ‘that’? Is the thing about Ozil. He can play like a savant for 15mins and make it possible to win. Aubameyang is my MotM.. Not only for his goals but also for his unselfish way.. He make our future more easier.. He break the wall of competition between them.. And we all now will see both of them playing together more often.. Hehehe.. I agree with 17ht.. Ozil is a better player after Wilshere replaced.. Sorry to say it.. But it’s the fact.. Playing him more width to accommodate Wilshere is a bad decision.. I was travelling through the snow-peaked Highlands with family when the mighty red and white were playing. saw the highlights and looked like a passionless affair for 2/3 of the game until the non-penalty (sorry that was a harsh decision by the referee) put some energy into the team. Great pen by Auba and great finish for the second, and real ‘three-musketeers-ship’ by Auba to give Lacazette the second penalty. Clearly, the PL has become second best to the UEFA league for us now. Let’s hope the boys put in a full, passionate shift on Thursday. I love LAMORE (L’Amour).. Hehehe.. And no Wilshere there.. 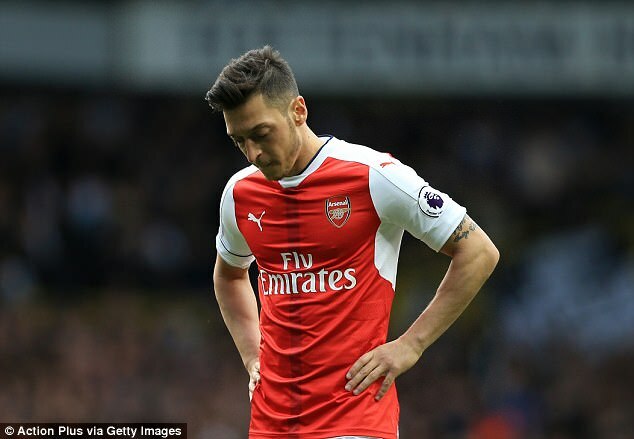 So sorry..
Lacazette – Aubameyang – Mhkitaryan – Ozil – Ramsey – Elneny..
And We still don’t have his (Wilshere) sign.. It’s only couple of months till his contract expired.. We don’t know what really happened..?? But I don’t think it is Wenger’s fault.. We will see..
Whose initials are also ‘JW’ coincidentally enough? That has an affinity for Super-Jack as well? Yesterday’s was Jack’s poorest outing in some time. Suspecting the interlull-knee-knock Gareth Southgate dismissed as insignificant– is a good portion of the cause. Not necessarily statistically, but from expectancy? Jack didn’t do the things he should have normally vs Stoke. Saw one such example in midfield– where Shaqiri did a tight pivot/pirouette with the ball that I would have expected Jack (defending) to have mimicked. He didn’t, or couldn’t. Likely, yesterday’s inclusion of Wilshere to the starting XI (where Kos was expectedly rested for CSKA)– was AW’s way of determining if Jack was going to start on Thursday. I’ll wager ‘not’ at this juncture. In my world we do not look at the way people look but what they do, their character, their talents, etc etc. Go on, Seventeenho, open up your hard to Super Jack; he isn’t that scary. On an entirely different note, what’s the situation in California re a judge’s ruling that coffee causes cancer and this now needing to be advertised on packaging??!!?? Here is my prediction for the last four in the CL: RM, Bar, Bay, Liv. Hence I will not be watching the games, except perhaps the MC-Liv game, which with good refereeing should be a decent battle to watch. Thanks for the coffee insights. (Browsing with Chrome) I right-clicked on the failed image placeholder you posted and clicked ‘Copy link address’ from the menu that appeared. Pasted the link into a text editor. What Google Images is doing is referencing an image on dailymail.com. In essence you posted a shortcut to a link. The WordPress theme of bergkampesque.com as configured, didn’t like the Googole Images shortcut. So– by removing the text up to and including the ‘=’ (equal sign)– you get an unencumbered link to location of the Daily Mail image. Cheers, JW… I’ll give it a try… Soon enough you’ll be working for Google (whose stock I bought today when it dipped below a big round number I’ll be able to remember)… And we’ll have to pay for those photos, no? I don’t know anything about J Muir. Will look it up. Alternatively, why not meet up in Spain? ‘We’ all work for Google* HT. We’re just happy about it. *Was an Orwell ‘1984’ devotee in my early teens (in the decade preceding the ’80s). Long before the internet and Wikipedia? Wrote a high-school paper detailing how I felt that Orwell had ripped-off Russian/Soviet-dissident Yevgeny Zamyatin’s 1921 novel ‘We’ (a story set in a dystopian future police state.). That English Literature teacher gave me a failing grade. Thought the idea preposterous. Then, come to find many years later– that several of sci-fi’s luminary writers had their own suspicions of whose stories had (ahem!) ‘borrowed’ themes from those who preceded them. Along with the expected attendant ‘tut-tutted refusals’ required from that sphere of writers. And ‘me too’ HT. No Apple/Macs ever. Good comments guys. Was away for a week travelling, so i am glad that we broke Stoke after a difficult first half. After the first penalty goal we were a little more relaxed, and started to score 2 more, one from another penalty. I have yet to see the full match, just the highlights, so cannot comment much. More to come from me. Relief and tempered-joy from minutes 74-thru-90+. I am no fan of Tony Pulis, but can you imagine the pleasure he would take from 3 teams he has previously managed in the prem, Stoke, WBA and Palace all being relegated at the same time. If he made the trip in the opposite direction with Middlesbrough, he might even manage a smile. good point, Retsubster. They all have putrid Pulis DNA running through their clubs. In the end? Proof Pulis is a good Championship manager. If CP went down? I’d still want to take a gamble on Zaha. So much there. If he played with quality, he could raise his game. An Ox-style winger/wingback already at the next-level IMO. In a year’s time– Holding, Kola and Zaha on the left in a 3-5-2? Just wondering.. Will Aubameyang allow to play after Dortmund out from this competition..?? Jw1.. I will go for Zaha also.. Hehehe..
Jw1 I guess its saying Pulis is a good prem manager, i dont think he has ever been relegated. Zaha is definitely worth considering. Lots of Palace supporters in my neighbourhood, but Palace dont raise much of a threat to our boys, even when we are not playing our best. Now if we could just get Spurs relegated!!!! Perhaps my indirect biases are rearing their unattractive-footie-loathing antennae? Knowing that Pulis and Mourinho are BFFs — goes far in my forming an opinion of both. Wasters of talent– to make an end. Anybody know if Pulis is actually undead? Jw1, thanks for the spoiler alert.. actually it is nothing too surprising about, given that they passed the ball well and we waited for them to be tired before we scored. We did well and the penalties were soft, but I don’t care about whether it was soft or not. We were at the end of some bad refereeing before, so its’ time that we had some soft ones back. Welbs and Jacko had an off day, and Auba did well given the number of passes from his teammates. I dunno JK… Seemed to me like our English boys played to their usual level… I will agree that we’ve gotten some nice (but very poor) calls in our direction lately… Thanks to dennis, maybe, should be offered? I rather talk about the Europa League, and i would like those who did not play in Stoke match to play in the coming game. Is Cech still out? I watched the second half and did not see Jack do anything that was bad or ‘at a lower level’. Nothing. He made himself available and when he got the ball, he worked hard to get himself into space as to deliver an attacking pass or combine with the attackers. In front of him movement was poor and he often had to pass sideways or backwards – both against his attacking nature – because of it. Now Welbeck was indeed below the expected level but to group him with Jack is not gaining much respect from me. As a team we lacked….. intensity and determination until the subs came on which gave the team momentum. Until then the entire team was to blame for a below par performance! As one of Jack’s regular praise-singers here? And not laying the entire team’s performance at Jack’s feet? If you’ve not watched the first half– your opinion might change. A thought that had occurred to me during that first half– was that watching Jack’s play? Reminded me of Elneny’s utility in feeding Jack the ball in the right spaces to foster attack. Only– Elneny was on the field at the time too– and neither seemed to be able to click with Ramsey. We went from 7/1 shots/on target first half– to 24/11 at fulltime. If memory serves– prior to Laca replacing Welbeck (on 60′)– we sat at 11/3. The remainder worthy of staying tuned-in. Whoa… Just tuned in to the CL match and Pool are up by 2… You maybe shoulda taken that bet, TA… 😀 Of course, it’s 2 legs, but it makes the next goal really big… And POOL GET IT!!! That is what Liverpool can do at Anfield. We have been dealt such a half by them a few times now. But the game is not over of course, and Citeh will come out determined to get a goal or two back. Could finish 4-2. TA. A quick note to say that you have mail. Just some thoughts I’d been mulling. If there’s a quiet spell on the blog it’s one to prompt some debate maybe? Sad to say that we are seeing that there was indeed more to come from the Ox following his move. Maybe it isn’t sad, not for the player for sure; but poses certain questions for us. Trying to fit in too many players at the same time would be my reflection, rather than backing a small squad and praying for luck with injuries. For me AOC is a player of moments, AB. He can be brilliant for a few minutes every now and again and then disappear again. A great goal though. Stayed 3-0 surprisingly. P Pool got Citeh properly rattled but game is not over yet. 17ht, I read your comments, but not fully, especially regarding the Ox. He needs massive spaces like Theo does. So, if they face teams that focuses on defending, then they will not be able to play well. I rather focus on tonight’s match. Couldn’t care more about Alexis or The Ox. Yes TA, you are right. Couldn’t care less about the ex-players. Citeh had lost to the Pools in the league this season and the incident on the bus scared them too. It seems that they are not all invincible, but the points gap between them and the second place team is just too big. Couldn’t see them dropping more points again. We have however seen the rarer advantage of having the 1st leg at home– in England. May not be the refs our boys need to be prepared for when heading to play the 2nd leg in Moscow. A psychological edge is worth percentage points of efficiency in-game. 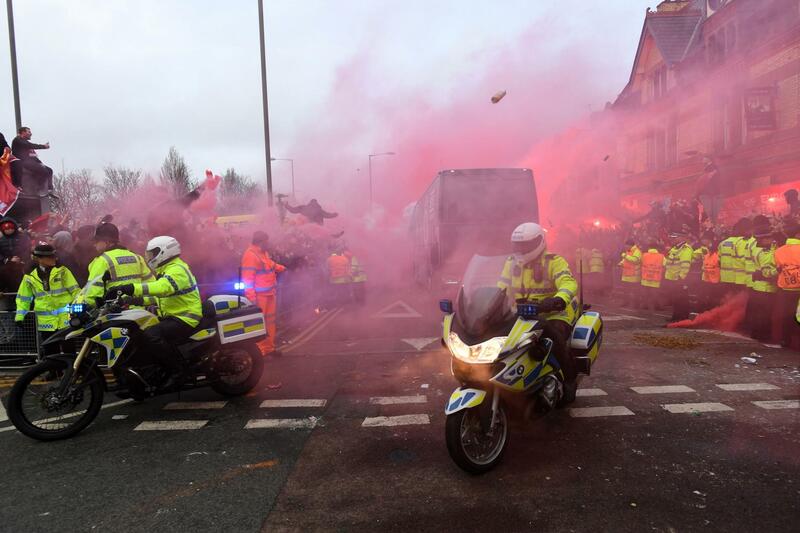 There is no possible way– this– did not affect City pre-match. One thing to be able to focus and prepare for the task you’re coming to do. Completely unexpected to have to compartmentalize this.